Contains the premium active ingredient Bromethalin, excellent for proven control of high rodent populations and severe infestations. Bromethalin is an acute, non-anticoagulant active that will begin to kill rats & mice in 2 or more days, faster than anticoagulant baits. Kills by affecting the rodents’ nervous system – Bromethalin is an ATP Inhibitor, which prevents the transfer of energy across nerve cells. 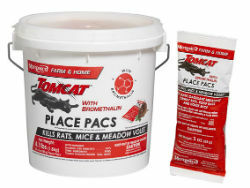 Due to a quick knockdown when compared to anticoagulants, more rodents can be controlled with less bait. Proven combination of palatability and effective control. Individual Place Pacs contain pellets and protect the bait from being contaminated by odors, moisture, or dirt. Excellent for getting bait to small, tight spaces or hard to reach areas. 3 oz. Place Pacs are sold in a tub of 22.